Admission to engineering programmes: 10+2 examination with Physics and Maths as compulsory subjects along with one subject Chemistry / Bio-Technology / Computer Science / Biology with minimum pass marks and WBJEE / AIEEE qualified. » Wi-Fi is available for the students throughout the campus. 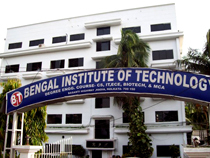 Bengal Institute of Technology was established in the year 2000 under the aegis of Techno-India Group, having the distinction of largest number of Engineering Colleges in West Bengal. The Group is engaged in development of tertiary level Technical Manpower to serve the emerging knowledge-based Society. The Institute is situated on Basanti Highway a few kilometers off from downtown Kolkata in a lush green picturesque setting, away from the madding crowd and din and bustle of a Metro and yet having the facilities of a City life. It is affiliated to WBUT and is approved by the AICTE. The Institute has adopted a Vision in its pursuit for excellence in Technical Education in conformity with UN Millennium declaration 2000; “To produce skilled (both Hard & Soft Skills) Technical manpower of high Quality” as a sequel to the “irreversible process of Globalization and need for mobility of Technical manpower across the National borders” “To apply and disseminate ICT and to play a crucial role in generating self employment opportunities”.